A few must-haves for Christmas shopping in Australia: sleigh bells, Santa hats, and...smartphones? 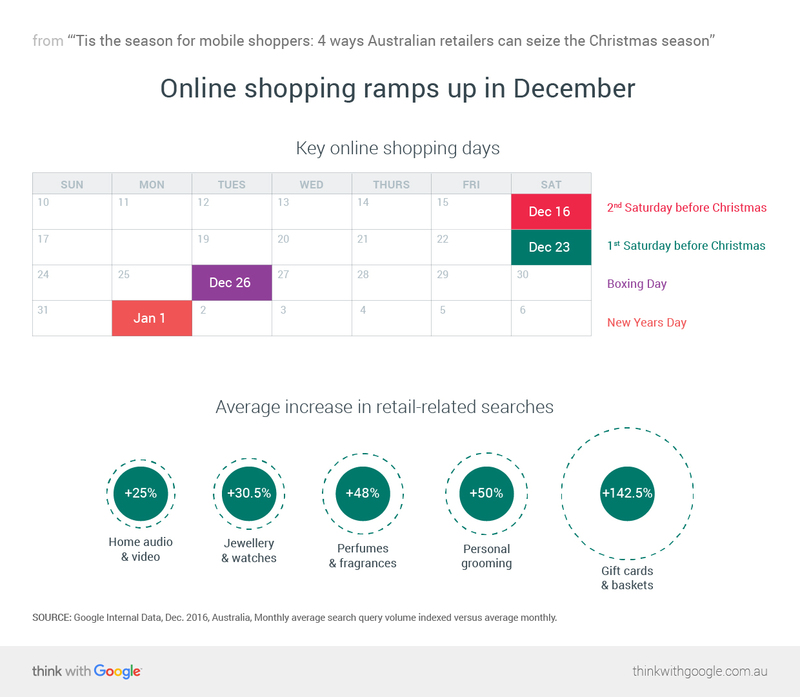 Here, Richard Flanagan, Google Australia’s head of business marketing, shares four ways that marketers can prepare to win the attention of Australia’s mobile-savvy shoppers this festive season. For some Aussies, the best part of Christmas is the traditions. To others, it’s all about sitting down to feast with family and friends. And, whether it’s a bid to stuff Christmas stockings or fill the fridge with snacks and sweets, for many, the festive season is synonymous with shopping. With the power to quickly and easily search for the best deals and gift ideas right at their fingertips, today’s consumers are thinking less about where they’ll buy and more about what they’ll buy. 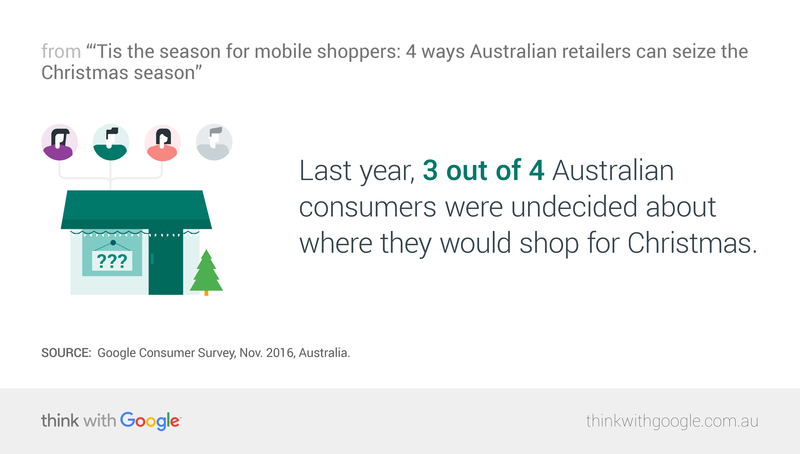 In fact, just last year, three out of four Australian consumers were undecided about where they would shop for Christmas.3 These shoppers’ attention and loyalty are up for grabs, which means huge opportunities for retailers to show up and connect in their moments of intent. 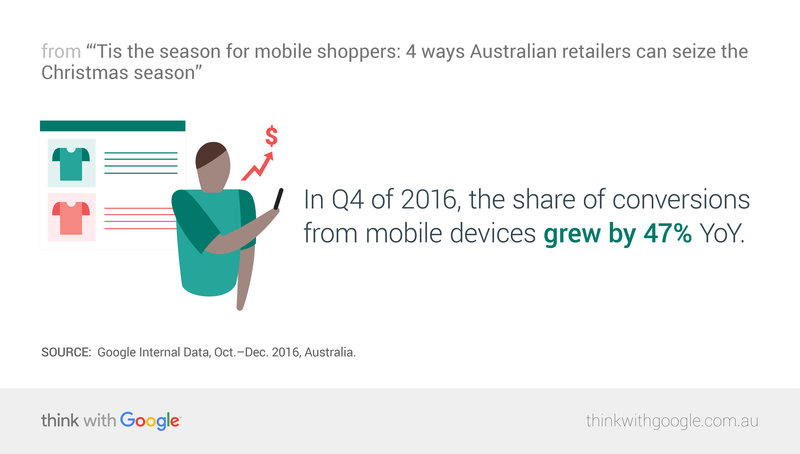 Source: Google Consumer Survey, Nov. 2016, Australia. Source: Google Internal Data, Dec. 2016, Australia, Monthly average search query volume indexed versus average monthly. Source: Google Trends, Oct. 1 2016—Jan. 1 2017, Shopping category, Australia. Just like browsing the aisles and clothing racks of a store, online shopping is a visual experience. Shoppers want to be able to get a clear picture—literally—of what they’re buying before making a purchase. Shopping ads are a great way to promote your online inventory by featuring detailed product information, including pricing and images, making it easy for customers to see and learn more about your products right from their search results. Once shoppers land on your site, they’re going to expect to be able to quickly and easily find what caught their attention. An easily visible, open text search box should be one of the first things mobile users see on your site. Shoppers aren’t going to bother swiping through multiple pages of search results. Make sure the first page of your site’s search results are the strongest, and implement smart-search features like autocomplete and autocorrect for misspellings to make searching and shopping even easier for mobile users. Here’s an all-too-common scenario: Michelle is shopping on her smartphone for a new dress and sees a stunning strapless in a shopping ad. Her size is in stock and the price is right, so she clicks through to the site to buy her new outfit...but the site takes too long to fully load. Frustrated, she bounces from the site and never makes a purchase. That level of impatience is the reality for most online users. In fact, 53% of mobile site visits are abandoned if they take more than three seconds to load.8 At the end of the day, a speedy mobile site is crucial for sealing the deal. Source: Google Internal Data, 2016, Global. Be sure to test your site for mobile-friendliness to see where improvements can be made, and consider building Accelerated Mobile Pages (AMP) to make your landing pages and search ads as fast as possible. AMP-enabled landing pages typically load in less than one second from Google Search and AMP ads load up to 5X faster than regular search ads,9 making for a faster and more seamless experience at every touchpoint. Whether they’re paying for home delivery or buying products online to pick up in-store, mobile-savvy Australians are getting comfortable making their final purchases online. In Q4 of 2016, the share of conversions from mobile devices grew by 47% YoY.10 Right up to the final step, speed and simplicity are still the name of the game. 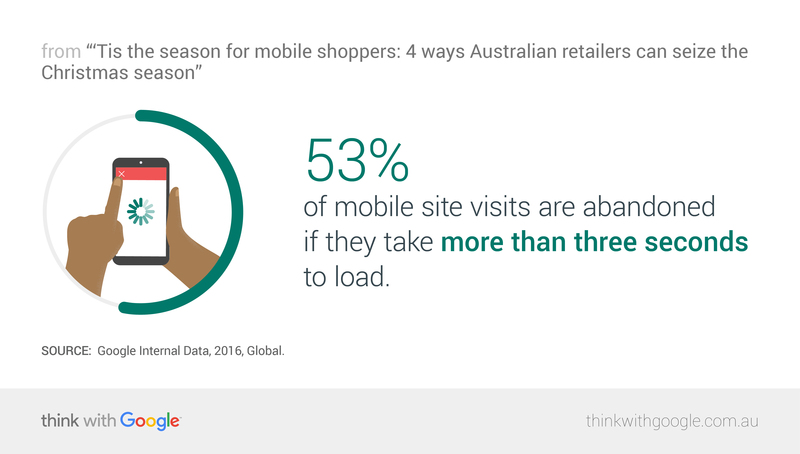 A lot of Australia’s online shoppers end up abandoning mobile purchase forms because they’re difficult to use, slow to load and refresh, or require multiple steps to complete. That’s a big reason why Australia has one of the highest retail abandonment rates globally—76.4% in Q2 of 2016.11 Setting up a Payment Request API allows retailers to eliminate checkout forms entirely and offer mobile users a simple, one-tap checkout process. Source: Google Internal Data, Oct.–Dec. 2016, Australia. A good deal of online shoppers still prefer to pick up their products in-store. This year, more than one-third of Australian shoppers plan to use click-and-collect services.12 Retailers that offer in-store pickup for online purchases can feature that option in their search ads and make it easy for shoppers to click through to their sites and use store pickup as their checkout option. As more and more Aussies pick up their smartphones to carry out their Christmas shopping, the opportunity for retailers is bigger than ever. By keeping a keen eye on seasonal search trends and leveraging the right tools, retailers can put themselves in a prime position to stand out and offer shoppers the speedy and seamless mobile shopping experience they’re expecting this festive season. 1 ShopperTrak, “Global Retail Traffic Index,” 2016. 2 Euromonitor, “Retailing in Australia,” Dec. 2016, Australia. 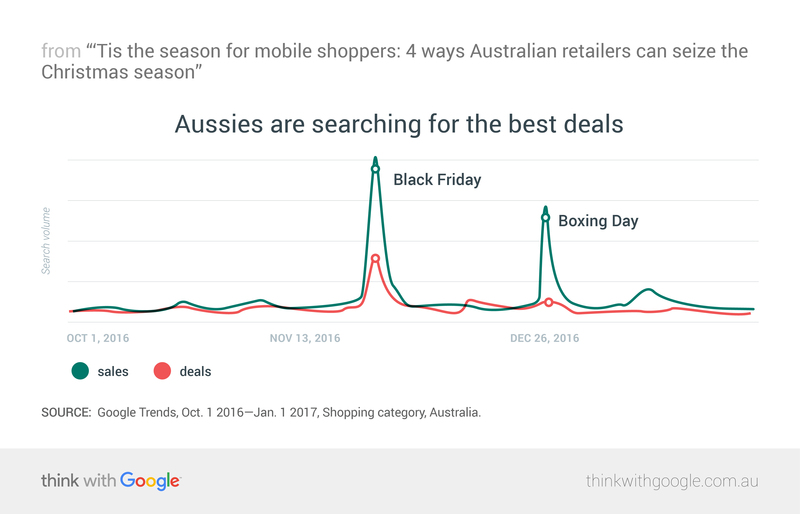 3 Google Consumer Survey, Nov. 2016, Australia. 4 Google Consumer Survey, March 2017, Australia. 5 Google Internal Data, Oct. 2015–Jan. 2017, Australia. 6 Google Internal Data, Oct. 2016–Jan. 2017, Australia. 8 Google Internal Data, 2016, Global. 9 Google Internal Data, Dec. 24, 2016, Australia. 10 Google Internal Data, Oct.–Dec. 2016, Australia. 11 SaleCycle, “The Remarketing Report - Q2 2016,” Global. 12 ACRS Monash University / PwC, “Retail & Consumer Market Insights | Q1 2017,” Australia, n= 500 Australian shoppers.